The challenge facing today’s change leaders is how to appropriately apply formal improvement methods such as Voice of the Customer to service and knowledge work, both within and outside the manufacturing environs. This highly readable text will help you excel at meeting that challenge. Chapters include exercises for applying concepts. Available on Amazon. Please contact us for quantity discounts (10 or more). The voice of the customer (VOC) concepts used today can be traced to Yoji Akao’s work with Toyota in the 1960’s. His 1978 book on his Quality Function Deployment (QFD) methodology introduced a valuable, rigorous but highly complex system. The purpose of QFD is to capture and translate customer desires into functional product characteristics and features that engineers could use for product design and improvement. The intent is to understand customer wants before building it for them. Akao’s system uses a series of matrices which are referred to as “the house of quality”. The full QFD system is far beyond what most of us mere mortals (non-engineers) will need, have patience for or will take the time to use. In addition to the need for simplicity, these VOC methods have several technical weaknesses or omissions which can waste effort and severely limit effectiveness of results. Poor applicability outside manufacturing. Service and knowledge work does not create long runs of identical products, so product design in that context requires a different way. Assumption that “the customer” is known. That can be a serious error. QFD-based VOC methods, such as those used by Six Sigma and ISO-9000 practitioners do not provide a clear method for determining the small number of finite roles a customer can play with a product or service. The result is that there is a high probability the most important customers do not get their voices properly solicited or heard. There is no explicit provision for uncovering customer desired outcomes, distinct from functions, features and undesired outcomes. These are all different “voices”, with desired outcomes being absolutely the most important. This book will help you to apply the easy-to-understand principles of customer-centered leadership to your unique circumstances in government, industry, healthcare and the not-for-profit enterprise. Rethinking work, quality, and satisfaction. This is a great thought provoking book. It proposes a paradigm shift in the way we think about work, about how we organize ourselves, and how we can create fans out of customers. It is also a hands on manual with a practical guide to how we can make changes in our organizations and dramatically improve the way we do things. In doing our work, most of us concentrate on the issues that pre-occupy us and the organizations we work for – issues like “How much does it cost us to produce such and such?”; “How well are we organized?”; “Do our processes comply with policy/standards/established procedures, etc. ?” This little book suggests that we think about our work as a matter of producing discreet products. For those who are in service and information organizations, this is not an easy concept to grasp initially. It requires a paradigm shift in thinking. However, once you see the work you do in these terms, you can then (1) identify the “customers” of such products and (2) begin applying product redesign concepts to create customer satisfaction. For anyone who is ready for a leadership challenge in their organization, this book is required reading. Transform Your Organization’s Culture! I met Rob Lawton nearly twenty years ago while participating in a workshop he conducted for my company. Based on the methods and concepts presented in “Creating a Customer-Centered Culture,” the workshop was part of a total re-engineering endeavor we were undertaking. We scrubbed every process and turned the entire culture of the company on its head. That workshop was a key part of our transformation in the marketplace. To this day, the lessons Mr. Lawton taught us remain engraved in my brain. Having learned his approach has continued to pay dividends throughout my career in supply chain management. Read the other reviews and you’ll get a good sense of the scope, relevance and value of what’s in store. One caution however, you will become an incredibly demanding customer in your own right! You may think you’re customer-focused now. Learn to think like your customers so that you can transform the culture of your organization through this readable, practical, straightforward and most importantly “useable” manual. The tools are thorough, but not complicated, and universally apply to most any type of organization. They are timeless. Business books come and go. Every few years I purge my bookshelves and keep only what is still relevant. 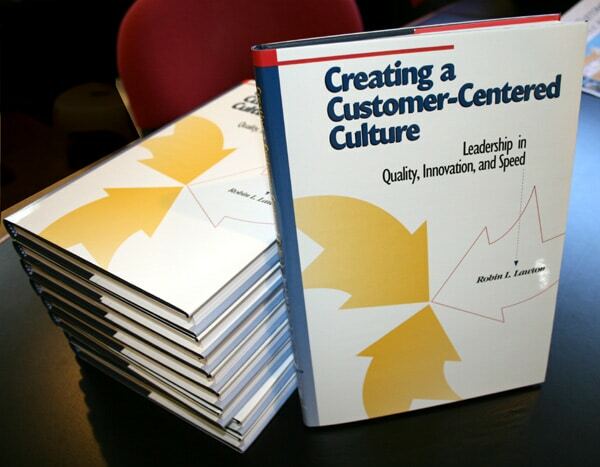 “Creating a Customer-Centered Culture” has survived for twenty years. I predict that it will remain relevant for years to come. As relevant today as when it was first written! In the introduction, Robin Lawton states the purpose of this book “is to provide a proven practical, approach to achieving and sustaining leadership in quality and customer satisfaction for knowledge and service work”. The book does this and more. 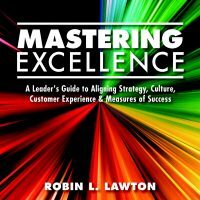 Robin makes a compelling case in this book for leaders in all industries to examine and reexamine how they view customers and how to measure customer success. As a quality professional focusing on semiconductors in the automotive industry, I continue to be challenged in moving company leadership from production based metrics to customer-based metrics. In discovering this excellent book, I saw that it is vocabulary that is key to making this shift. Once key internal leaders have a common understanding of the difference (and similarity) between, ‘product’ and ‘service’ it makes for easier conversations and more agreeable action plans. I have been most enthralled by the contents of Chapter 4, ‘Measuring Service Quality’. This chapter is a great stand-alone chapter as it has easy to understand steps (eight steps total) upon which to build metrics that are true measures of the voice of the customer. Even those that say “…but our industry is different….” cannot ignore this book. What leader in what industry would disagree with the following as their customer’s priorities; ease of use, timeliness, or certainty? The only difference might be how these priorities are characterized and measured. The book may have been written over twenty years ago, but it’s as relevant today as when it was first released. In that sense, it’s a classic. Rob Lawton’s handbook treats the subject of pursuing Customer Satisfaction from a culture point of view. A ‘must read’ text for managers and executives that are pursuing this important goal. “He does an excellent and unique job of explaining the subject. He provides the management and tactical tools to implement a culture change to achieve Customer Satisfaction internally/externally to the organization. Larry A. Whobrey, Quality Improvement Manager – Caterpillar, Inc.